SUBLIME HIP HOP GENIUS BEAMED STRAIGHT FROM PLANET WEIRD. "We Don't Fit In. We're hip hop insiders - not dilettantes, as some people think - but shops refuse to cross-file acts so we can't be in the hip hop section AND the indie rock section AND the experimental section and we aren't big enough to have our own section yet... maybe we should up our output: sign loads of acts and call them cLOUDDEAD or put out recordings of us singing in the shower - 'The Shower Sessions'!" So says Dose One, one third, along with why? and odd nosdom (nb: not their real names), of cLOUDDEAD, makers of this month's other album of Godlike genius. But that's just the risk you run when you put out six 10-inch records in issues of 1,000 each, that sound like three guys locking themselves into a studio and not coming out until they've made the world's first Syd Barrett, My Bloody Valentine and Boards of Canada - influenced hip hop album, while consuming all the chronic IN THE WORLD. Woozy found sounds paw drunkenly at the lapels of beats that want to tell you about the time they met Dan The Automator in the toilets at Glastonbury. Meanwhile barely audible rhymes, delivered in astounding flows that recall the old skool days when skills were what hip hop was all about, but also recall speaking in tongues, deliver messages like "One man's floor/ Is another man's floor with a pillow on it" and "The plants call you a lonely monkey / In a very large glass cage". 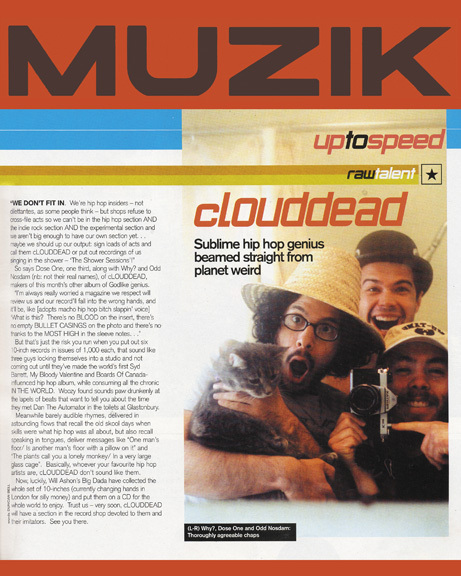 Basically, whoever your favourite hip hop artists are, cLOUDDEAD don't sound like them. Now, luckily, Will Ashon's Big Dada have collected have collected the whole set of 10-inches (currently changing hands in London for silly money) and put them on a CD for the whole world to enjoy. Trust us - very soon, cLOUDDEAD will have a section in the record shop devoted to them and their imitators. See you there.